Can a children’s toy function as a subversive agent of anti-capitalism? Possibly. The Free Universal Construction Kit is a set of design plans for nearly 80 two-way adapters capable of joining together individual parts from ten popular brands of construction toys, allowing for interoperability between otherwise incompatible construction toy parts. Available for download at no cost to consumers, the kit is a “physible” product rather than a physical one—a digital file of specifications for objects fabricated via a 3D printer. The adapters can be fabricated on any small-scale 3D printer, similar to the physible chair designs from Joris Laarman Lab’s Bits and Parts (2014) project, on view in the Joris Laarman Lab: Design in the Digital Age exhibition through January 15, 2018. Anticipating a near future when the public has easy access to 3D printing, physible products are an example of how recent technology can increase public engagement with the process of making, rather than removing them from it. After witnessing his son’s attempt to connect pieces from various construction toy systems, kit designer Golan Levin challenged himself to find an elegant solution to a seemingly impossible design problem. To develop the plans, Levin and co-designer Shawn Sims used a powerful optical comparator to measure the toy systems’ dimensions to within less than .0001 of an inch, ensuring the accurate fit of each connecting adapter. 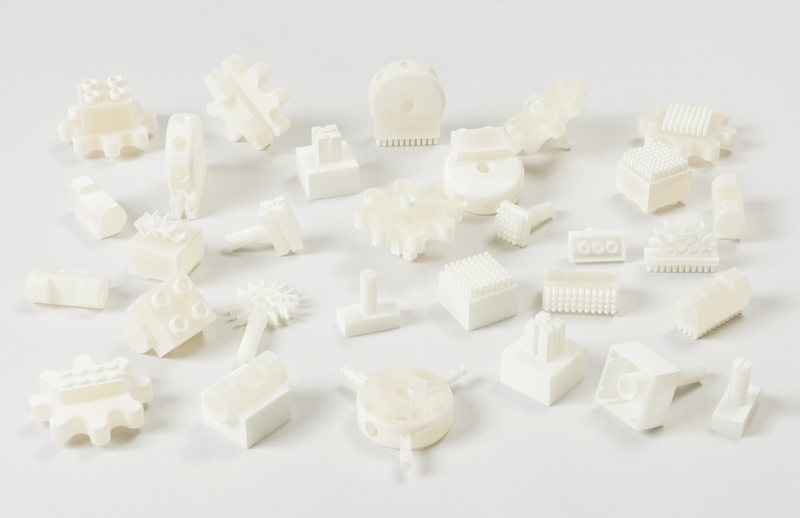 The adapters in Cooper Hewitt’s permanent collection were manufactured by 3D Systems and printed in thermoplastic using fused deposition modeling (FDM). The kit has been designed for printing by the individual user using small-scale, non-industrial 3D printers. Intended to foster children’s nascent spatial reasoning and engineering skills, construction sets are meant to teach children as much as entertain them during playtime. The Free Universal Construction Kit seeks to subvert the uneasy pairing of education and commerce, or the commercialization of childhood. Often identified as instrumental in the development of design genius—especially in the field of architecture—Frank Lloyd Wright describes playing with Fröbelgeben (Fröbel gifts), the first widely-used proto-construction toy kit developed by German educator and inventor of Kindergarten Friedrich Fröbel as a formative experience. Not coincidentally, Frank Lloyd Wright’s son, John Lloyd Wright, would go on to introduce Lincoln Logs to the rapidly expanding construction toy market in 1917. Levin describes his work as that which “makes visible our ways of interacting with each other, exploring the intersection of abstract communication and interactivity.” If toys are a vision of the future, projections of the societal aspirations of their adult creators, then The Free Universal Construction Kit acts as a leveling agent, helping return the basic challenge of playing with construction toys back to fitting one part with another without a provided plan. By expanding toys’ interoperability, the kit helps counteract what historians Brenda and Robert Vale see as a decrease in children’s creative thinking caused by overly-prescribed toy systems that supply structured blueprints and feature familiar characters from film and television. Along with the various two-way connectors, Levin and Simms developed a “universal adapter,” a single piece with every single connector. It is not practical, but that’s hardly the point. It is the universality rather than the practicality Levin and Simms want to emphasize. The Free Universal Construction Kit speaks to a cultural moment of life-hacks and egalitarian access to technology, a manifesto for the future concisely stated via children’s toys. Lego, Duplo, Fischertechnik, Gears! Gears! Gears!, K’Nex, Krinkles (Bristle Blocks), Lincoln Logs, Tinkertoys, Zome, and Zoob. See Brenda Vale and Robert Vale, Architecture On The Carpet: The Curious Tale of Construction Toys and the Genesis of Modern Building, (London: Thames Hudson), 2013.